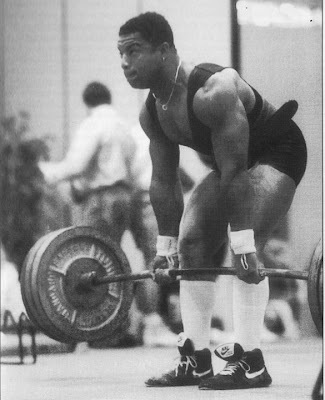 Sumo Deadlift, bar approaching knee height. Everyone knows how to train the shoulders, or so most powerlifters, bodybuilders, and weight trainers think. 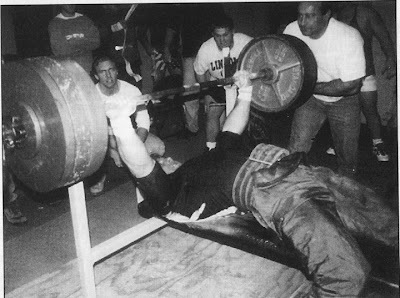 After all, the classic “hand me down” exercises for shoulder training are there to see in nearly every weight room in the country. Classic pressing movements (military, behind the neck, incline, dumbbell, etc. ), as well as dumbbell raises (front, back, etc.) usually constitute the majority of the typical shoulder training “menu” of exercises. The question here is whether shoulder training is as simple as it seems. If we all know the total story on shoulder training, then logically one would expect there to be no serious problems where shoulder development, shoulder pain, and shoulder injury are concerned. Is this the case today? I would argue strongly that it is quite the contrary. I have begun to realize in recent years that the shoulder is a key problem area. Probably no area requires more thoughtful training and “injury proofing” than the shoulder. It is amazing to me how many powerlifters and weight trainers whom I’ve talked to have sore or injured shoulders. Typically, the shoulder problems they have are related to a variety of activities, including bench presses, throwing and racquet sports, classic shoulder weight training exercises, etc. It is evident that not many people in or outside powerlifting are really doing the job when it comes to shoulder training. Maybe we all need to do a bit of reevaluation of our classic shoulder training “menu” of exercises after all. Let’s briefly look at what’s involved. Specifically, for the shoulder complex, there are three bones involved: the scapula, clavicle, and humerus; eight ligaments: coraco-humeral, sterno clavicular, etc. ; seven joints: acromio-clavicular, etc. ; and believe it or not, 17 muscles, including deltoid, pectoralis major (both sternal and clavicular portions), the four rotator cuff muscles, teres major, latissimus dorsi, biceps, triceps (long head), serratus interior, pectoralis minor, levator scapula, rhomboids, subclavicus, and trapezius. For more information, as always, refer to a good anatomy text. If is easy to see that the shoulder complex structurally is by far one of the most complicated parts of the body. As a direct result we also have a much greater range of motion possible in the shoulder than in any other joint of the body. Unfortunately, however, this very complex range of motion possible at the shoulder joint makes detailed quantitative biomechanical analysis incredibly difficult. Indeed, methodologically the biomechanical estimation of shoulder muscle activity is so complex that the research that does exist necessarily involves only estimates for the motions and forces involved with the shoulder. One important point to be made here about the shoulders is that the important muscles and ligaments crossing the shoulder joint are key to shoulder stability. Unlike many other joints of the body (like the hip, for example) the shoulder must heavily rely on muscle and ligament activity rather than skeletal strength for its stability. Therefore, development of the important muscles of the shoulder complex is extremely crucial for preventing problems in activities involving the shoulder. Let’s examine the shoulder musculature more closely. By now you have no doubt guessed, there is nothing simple about the shoulder muscular system. In fact, there are a number of very unusual features that characterize the muscle action of the shoulder. First of all, there is an unusually high amount of contraction where two or more muscles are contracting simultaneously. Since the shoulder joint lacks stability without muscle action, any muscle that acts to move the arm must work harmoniously with other muscles in order to avoid causing a dislocation. In other words, a large number of shoulder muscles are involved in probably every shoulder motion. Classic references like Inman et al (reference 2) point to this fact. The second point distinguishing shoulder muscle activity is the number of two-joint muscles. Depending on the position of the arm, scapula, and clavicle, these two-joint muscles will have different effects on shoulder motion. As the position of the bones changes in exercise, for example, muscle activity changes dramatically. This has been demonstrated in several “classic” studies of shoulder biomechanics (for example, references 1 and 2). In other words, small changes in arm of shoulder positions will have significant effect on which shoulder muscles are involved and when and how much these muscles work in a given weight training exercise or a sport motion. While it is beyond the scope here to try to explore all aspects of the shoulder muscle activity, a few points can be made concerning the deltoids and “rotator cuff” muscles. The three major muscle fiber populations of the deltoid muscle (most often referred to as anterior, lateral, and posterior “heads” of the deltoid) are apparently each capable of contracting fairly independently of the other heads. In other words, bench presses conceivably involve the anterior “head” while the other two heads are largely inactive. It is, however, overly simplistic to view the activity of the deltoids only in this sense (by saying, for example, that front lateral raises work only the anterior head of the deltoid, lateral raises work only the lateral head, etc.). What really happens is much more involved and probably not remotely as clear cut. Many muscles of the shoulder are involved in any shoulder exercise. As for the four “rotator cuff” muscles, the major action of these small muscles is to pull the head of the humerus (the upper arm bone) into the glenoid (the shoulder). In doing this, the deltoid muscle has better leverage and is able to elevate and move the arm more efficiently. First of all, my personal feeling about shoulder training is that until a more detailed biomechanical study is done and completed on the shoulder, “variety” and “instinct” should be the two key words. By variety I mean that one should experiment with a greater number of exercises for shoulder motion than simply the “classical” menu. One suggestion is to visit a good physical therapist or anyone knowledgeable in shoulder exercises to see the type of exercise they use for shoulder training. Some excellent “non-classical” exercises are available to try out. By “instinct” I mean you should attempt to “tune-in” as much as possible to the body’s response to shoulder movements and exercises. 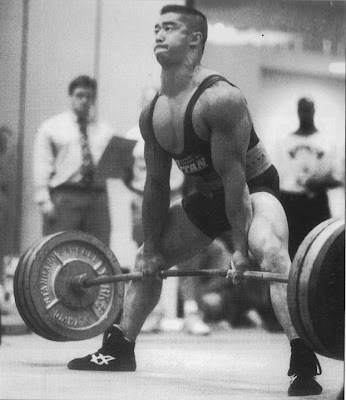 Most top powerlifters have a great knack of evaluating exercises in this manner. This is something we all need to at least try to be aware of in our training. (3) Increases in bench press weight only cause modest increases in deltoid activity, presumably since this muscle is already so maximally involved. (5) Machine training for the shoulder region should be treated very cautiously. Generally some of the muscles that stabilize the shoulder probably eliminated in activity (or reduced significantly) since the degrees of freedom are limited by machines. Thus, shoulder exercises when done on machines can often lead to incomplete development of shoulder joint musculature. I strongly recommend that one use primarily free weight motions for a complex region like the shoulder. Well, I hope that I have provided some food for thought regarding shoulder training. Above all, don’t be afraid to experiment and learn from your own body’s responses to training. Shoulder training, like weight training in general, is anything but “simplistic”. Instead of blindly copying everyone you see, try to “tune-in” to your own body’s responses to exercises. The rewards are well worth it. (1) Deluca, C., Forest, W., “Force analysis of individual muscles acting simultaneously on the shoulder joints during isometric abduction”, Journal of Biomechanics, 6: 385, 1973. (2) Inman, D, Saunders, J., “Abbott, L., “Observations on the function of the shoulder”. Journal of Bone and Joint Surgery, 26A: No. 1, 1944.